I don’t know how many people remember the old horse and milk wagon that used to go around the streets picking up empty bottles and replacing them with fresh bottles of milk. When I was about eight years old, the milkman would pay me 2 cents a bottle. Some customers would put their weekly milk payments on top of their empties on the porch; they were always people who lived in big houses and who had big money. My family had to live too, so a few bucks here and there plus my $1.50 per day helped us stay alive. PS: Tony has a court date on Monday, Feb 26. It’s also his 58th birthday. This entry was posted on	February 23, 2007 at 5:32 pm	and is filed under $0.02, 2 cents, bottle deposit, cream, delivery truck, empties, horse drawn milk wagon, job, milk, milkman, morning ritual, poor, right to eat, schoolkid, skimmed milk, skimming, stay alive, stealing, surviving. hang in there Tony… I’ll be thinking of you. Not a great way to acknowledge one’s birthday…. in court. good luck today Tony. I remember the Milkman, the glass bottles, the empties on the porch. But our Milkman came in a truck. The only way to see horses was to go to the “country” where there were farms, or at the Stables. My family is having an 80th birthday celebration for my Dad in May. His favorite toy as a child in the 1930’s was a horse-drawn milk wagon that he said had a team of three black horses. I’ve been searching the internet for something like that and can’t find it. Have you seen anything like that? I want to buy one for him. Or do you know of a source where I could look at photos? 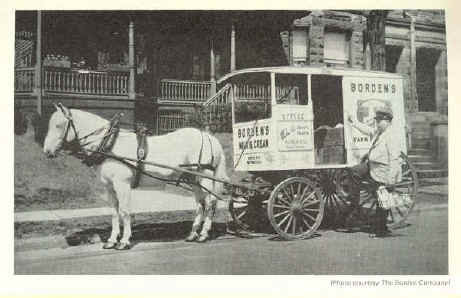 My grandfather used to talk about the old horse drawn milk wagon’s and how he used to deliver milk early in the morning. He said the horses had been doing their routes for so long that they knew when and where to stop …it was just a matter of routine. He always wanted me to get a job on a milk wagon…early morning. When I was a kid, I had an early morning paper route, and back then, milk was still delivered to the customers door steps…..and on occasions, when I saw some chocolate milk, I’d peel back the paper top, and chug down about half the quart…..grin….and put it all back together……it was real refreshing. Thanks for letting me drift back to my Grandfather and some of my childhood antic’s. oh and I hope you finally got out of jail. I would like to post a picture of a milkman & his horse & wagon on facebook.. Been having a problem getting the picture there.